It is freezing outside, so why even bother going out? stay inside where it´s warm and cozy. We present you here a list of some of the coolest indooractivities in Berlin. And, okay you have to go out first, but Berlin has a good public transport system, so that shouldn´t be a problem! If you need help with how to get there, just come ask us at the reception! This is a traditional butcher, if you like meat and sausages go here to experience the true nature of the German meat culture…. They do lunch too, traditional food, meat! For small prices! This place is famous for its traditional black pudding. High quality! This is really a nice experience! But nothing for you if you are a vegetarian! Kind of kitschy modern deco German Restaurant, nice ambient and friendly service. 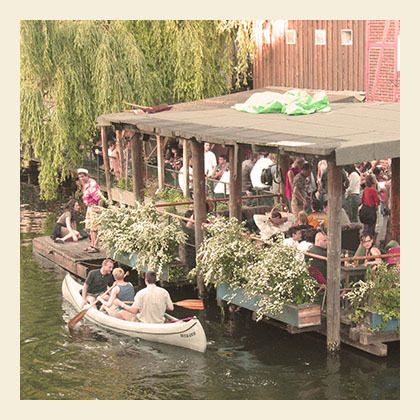 Located in the vivid WranglerKiez which is really worth a visit if you are in Kreuzberg! They serve really nice Swabian food like for instance Flammkuchen! Also, as a big fan of Spätzle, I could really recommend their Käse-Spätzle (spätzle with cheese). you. The name of the shop translated in to English means as much as buy yourself happy. great wine and philosophize in a relaxed livingroom-feel atmosphere. wine. when you leave you can pay whatever you think it was worth. Don´t go here to late, when the wine is out, its over and out!! What else to expect at the White Trash, great live music & a great rock´n´roll atmosphere!! Enjoy wintertime in Berlin! For more suggestions on what to do in Berlin just read our blog on Berlin!